The official residence of the Brazilian Presidents for over the years, the Alvorada Palace by the Paranoá Lake was built in 1957-58 and designed by the renowned architect Oscar Niemeyer. 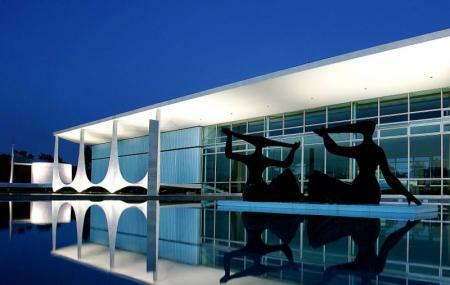 Listed among the National Historic Heritage Sites, the Alvorada Palace depicts the contemporary Brazilian architecture along with the technical and cultural progress of Brazil. The name of the palace denotes Palace of the Dawn and it features a unique blend of water, marble, and glass. The marble columns are the symbols of the city and they touch the floor in a vortex while their reflection falls on the water mirror and the glass façade. You are free to explore the State Room, Mezzanine, Music Room, Noble Room as well as the residential Second Floor. Please correct the text on Events. Tue, Jan 1 - Posse do Presidente BOLSONARO 2019. PRESIDENTE LULA IS IN JAIL, YOU FOOLS!!!! DON'T TRY TO FOOL THE SIMPLE PEOPLE. IT DOES NOT CHANGE THE FACT THAT LULA IS IN PRISON!